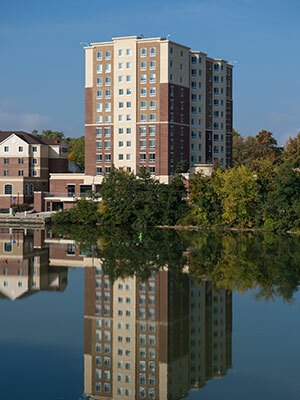 Brooks Crossing Apartments were constructed in a joint undertaking between a private developer and the University in 2014. This area is named after the location and rests at the intersection of Brooks Avenue and South Plymouth Avenue. It features upperclassmen private bedroom apartments with full kitchens similar to the Riverview Apartments. Air-conditioning, private bathrooms, and wireless and wired internet access are available to all residents. The total occupancy is 170 students. The building includes laundry facilities and is conveniently located to several local businesses and restaurants. For more information, see the Brooks Crossing Handbook (PDF) and Brooks Crossing floor plan (PDF).